Gabriella works as a swing dance teacher and performer located in the city of Stockholm where she also grew up. She has been trained by the Harlem Hot Shots and is one of the hard working members of the group since a couple of years. She originally got acknowledged for her unique style and charisma and has later grown into a great inspiring teacher. Gabriella inspires with her stylish swivels and she pushes her students, especially followers, to develop and trust in their unique style and technique. Nils was born and raised in Mora, Sweden. Moved to Stockholm in 2006. Started dancing Lindy Hop at the Swedish Swing Society in 2009. In 2016 he became a member of the swing dance company Harlem Hot Shots. Nils loves fast and acrobatic Lindy Hop and tap dancing. 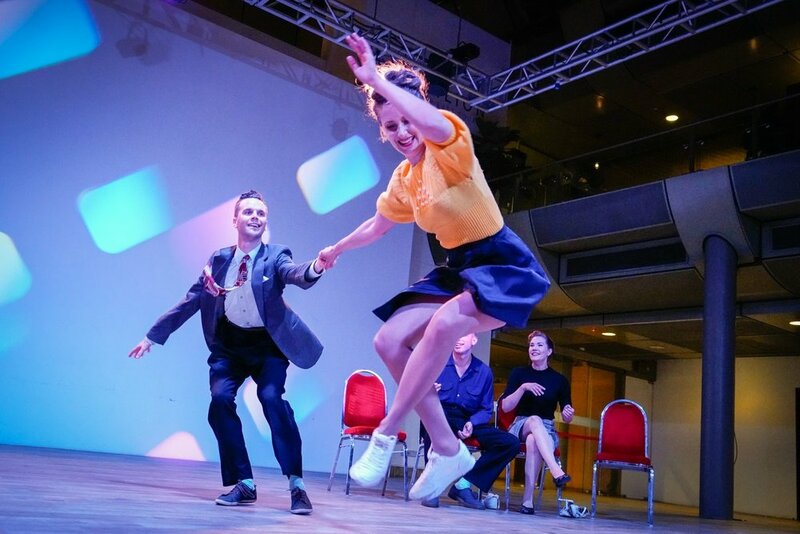 Mimmi and Fredrik represent a young generation of Lindy Hoppers. Both live in Stockholm and are very active in the social dance scene. In 2012 they became members of the famous dance troupe The Harlem Hot Shots. Fredrik and Mimmi are known for their authentic style and jazz movements. They get their inspiration from the old movies and love the raw style of the Savoy ballroom. Between rehersals and regular teaching at the Chicago Swing dance Studio in Stockholm, they travel to perform and teach around the world. Emil, a relatively late starter of swing dancing, was sucked into the scene of social dancing in Stockholm at the age of 22 and has been a passionated part of it since. His admiration for the originators of the dance combined with his passion for the music and aesthetics of the swing jazz era is the foundation from which he shares his dancing in class. Emil is a two time winner of Stockholm Open, strictly lindy hop division. Sandra loves to dig into old swing clips: to study, learn and finally teach them. She has taught all over Europe and also in Asia. Teaching and performing the swing dances is a big passion in her life. She also has a big interest in vintage fashion, hairstyle, décor and interior. Sandra is a dancer, teacher, choreographer, producer and event organizer. She has won Stockholm Open, strictly lindy hop division, three times, came 2nd in strictly lindy hop at Snowball 2012 and placed 3rd in the advanced jack n jill at ILHC 2012.
company The Harlem Hot Shots. classes as well as their social dancing. Maja comes from a dancing family, often traveling around dance camps and competitions as a child. At the age of 15 she was certain that dancing and singing would be the right way in life. Now Maja has a professional dancer’s degree from the Stockholm Ballet Academy and has been working as a dancer, singer, teacher, producer and choreographer for many years. She gets her inspiration from the big dancing stars of the golden era such as Fred Astaire, Eleanor Powell and The Nicholas Brothers, just to name a few. Anders has studied dances such as ballet, contemporary and authentic jazz since the age of 10 and has developed a passion for body movements and teaching dance. At the age of 13 he fell in love with Lindy Hop and has since then been fortunate to teach and perform around Sweden and Europe. With inspiration from the original Hoofers, Daniel is one of the dancers that still working in the style and rhythm heritage that once was created by the legends during the era of swing. To dance and to spread the traditional dance style built on rhythm gives him inspiration and the power in life. His ability to dance lots of different styles make him a respectful dancer. As well as a broad variety of Tap styles Daniel also dance traditional Lindy Hop, Charleston, Jazz and is a well educated Modern Jazz & Ballet dancer. He works professionally at theatres in the musical scene where not only dancing, but also singing and acting is a part of his profession. He ́s been working in shows such as Crazy for You, Love Never Dies, Singing in the Rain, Guys and Dolls, Producers, Chicago, La Cage aux Folles, Beauty and the Beast, Grease and many others. Daniel is also in to choreography and he choreographed musicals like The Wild Party, Spelling Bee and Rebellas Skatt. As a teenager, Elin started spending aaaall her summers in Herräng – living life, performing as a part of the HDC Chorus Line and working in the legendary Midnight Ramble. That's where it all began! The lively jazz scene of Stockholm taught her well, and nowadays Elin work with dancing in all kinds of ways. Her expertise ranges from solo to lindy, coaching show groups to kids, performing everything from numbers to full length shows – and she is usually working together with Swedish legends that you all know the names off…Partnering and competing with Rasmus Holmqvist, she was a part of conquering the Savoy Cup Team Battle for years in a row! She teaches regularly in Stockholm at Chicago Swing Dance Studio and internationally. Some even say she lately joined show group Messaround. And not to forget she is in the Hotcha Chorus Line since almost 7 years!